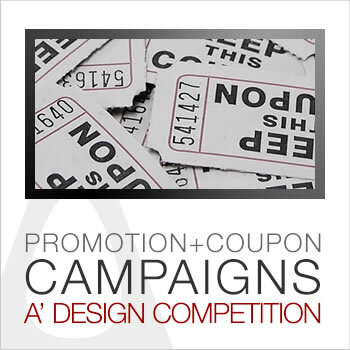 This page describes the A’ Design Award & Competitions’ Campaigns, Promotions and Coupons. To increase the number of participants and to increase the variety of submissions, each year at different periods, A' Design Award & Competition offers opportunity for designers from different fields to join the competition with discounted fees, and in certain cases some certain promotions will be activated. 27-30 December (3 Days), Annual : To provide an opportunity for upcoming designers and to celebrate a designful year ending, each year between 27 and 30 December, just before the new year starts, A' Design Award & Competition offers opportunity for designers to join the competition with discounted fees. Learn more about this program here. 27-30 May (3 Days), Annual : To especially increase the variety and category distribution of submissions for a better competition, each year between 27 and 30 May, A' Design Award & Competition offers opportunity for designers from especially underrepresented different fields to join the competition with discounted fees. Learn more about this program here. 27-28 February, (2/3 Days), Annual: Once a year, 2 or 3 days before the nominations deadline of the current competition period, before the nominations close, A' Design Award & Competition offers opportunity for designers from different fields to join the competition with discounted fees for the following edition of the competition. I.e. These tickets are valid for the next year of purchase. Learn more about this program here. 27-30 April (3 Days), Annual : To provide an opportunity for upcoming designers, to increase the number of award participants and to increase the variety of submissions for a better competition, each year between 27 and 30 April, A' Design Award & Competition offers opportunity for designers from different fields to join the competition with discounted fees. Learn more about this program here. 27-30 June (3 Days), Annual : To provide an opportunity for middle-age talented designers, to increase quality of design submissions and to create competition for a better design award, each year between 27 and 30 June, A' Design Award & Competition offers opportunity for young middle-age designers to join the competition with discounted fees. Learn more about this program here. 28-31 July (3 Days), Annual : Advertise your designs, products and architecture via winning a design award. Use the express nomination tickets when nominating your designs and get 3 days express judging service. Learn the results of your design nominations within 72 hours after nomination. Receive rich winners’ kit and advertising tools and services for your brand if you are selected as winner. Learn more about Design Advertising Campaign. • Visit the Campaigns page to learn more about other opportunities for taking part in A' Design Award & Competition.